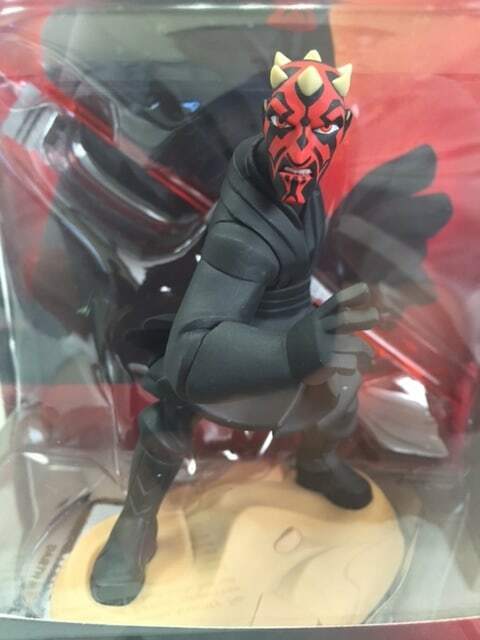 Today Disney Interactive announced that finally, Darth Maul–as well as three other new playable characters and a brand new Power Disc Pack–are available for Disney Infinity 3.0 Edition. I really love Maul’s sculpt: he looks menacing, his robes flare out dramatically, and the paint application is perfect. GLENDALE, Calif. – (November 3, 2015) – Today, Disney Interactive announced that four new playable characters and a brand new Power Disc Pack are available for Disney Infinity 3.0 Edition. Today’s launch represents the fourth wave of new offerings for Disney Infinity 3.0 Edition and includes the first Marvel characters for Disney Infinity 3.0, Hulkbuster and Ultron, as well as one of the most highly anticipated Star Wars™ characters, Darth Maul. Also available today are new products for Disney•Pixar’s The Good Dinosaur including a Spot figure and themed Power Disc Pack. ULTRON: Ultron, the world’s most advanced robot and maniacal Super Villain, will stop at nothing to destroy humanity and their protectors, the mighty Avengers. With the ability to summon duplicate robotic sentries, the character uses magnetic pull followed by a powerful blast of energy to defeat his foes. HULKBUSTER: Hulkbuster, the mega-sized armor created by Tony Stark, combines the incredible force of Hulk with the tech capabilities of Iron Man. A brute tank, Hulkbuster’s powerful combo attacks are great at dealing with nearby groups of enemies while his Thruster Dash makes up for his lack of overall speed, allowing him to close distance with targets easily. Missiles, thrusters for flight and a suit-integrated tractor beam complement this powerhouse. DARTH MAUL: The deadly Darth Maul uses his double-bladed Lightsaber™ and dark side Force™ powers in death-defying duels against his enemies. SPOT: Spot is a wild, tough and tenacious human boy who thinks and acts like a dog. Using his hands, feet and teeth he keeps enemies at bay. DisneyŸPixar’s The Good Dinosaur Power Disc Pack comes with four Power Discs that introduce dinosaur mounts to the Toy Box. · Nash – Call on Nash, the tough cattle ranching T. rex, to help you explore the Toy Box. · Arlo – Create epic adventures with Arlo, your big-hearted Apatosaurus friend. · Butch – No Toy Box adventure is too big for Butch, the toughest T. rex you’ll ever meet. · Ramsey – Call on Ramsey to help you seek out rustlers and stomp around the Toy Box. Darth Maul, Hulkbuster,Ultron and Spot character figures are available for $13.99 each and Disney•Pixar’s the Good Dinosaur Power Disc Pack is available for $9.99. The Disney Infinity 3.0 Edition Starter Pack, which includes the Star Wars™ Twilight of the Republic Play Set, is currently available in major North American retail stores for the PlayStation®4 and PlayStation®3 computer entertainment systems, Xbox One and Xbox 360 and the Wii U™ system from Nintendo. Disney Infinity 3.0 Edition is rated E10+ with Cartoon Violence by the ESRB and developed by Avalanche Software in partnership with Ninja Theory, Sumo Digital, Studio Gobo and United Front Games. Additional Play Sets, Figures and Power Discs are available and sold separately. Disney Infinity is an interactive gaming platform where players have unprecedented freedom and endless opportunity to create stories and play experiences starring the beloved characters from across The Walt Disney Company. Building on the success of Disney Infinity 1.0 and 2.0, Disney Interactive launched its latest installment to the best-selling “hybrid toy/video game” this year — Disney Infinity 3.0 Edition. In its third iteration, players will utilize real-world interactive figures to activate original storylines (Play Sets) in the virtual game worlds of popular Star Wars franchises and create new adventures with a variety of characters from Marvel, The Walt Disney Co. and Disney•Pixar properties in the Toy Box mode. Disney Infinity 3.0 is rated E10+ by the ESRB and will be available in stores this fall For more information, visit Disney.com/Infinity. Entertaining guests of all ages, Disney Interactive’s key products include the video game platform Disney Infinity, top virtual world for kids Club Penguin, popular mobile franchises like Frozen Free Fall and Disney Tsum Tsum, top online destinations for kids, parents and fans including Disney.com, Oh My Disney, and Babble.com and the Disney social network reaching more than 1.5 billion guests on Facebook.